As companies around the world rush to take on new business opportunities in post-sanctions Iran, South Korean builder GS E&C is out to regain its former presence in the country where it has built up a solid track record in the construction segment. The Iranian construction market has remained virtually untapped since international sanctions took effect in 2010. Having successfully carried out major projects in Iran before, GS Group’s construction unit expects to gain an upper hand in winning fresh deals in the country. GS E&C has completed five construction projects totaling some 2.4 billion won ($2 million) since establishing its Tehran office in 2001. The firm’s most notable achievement is the South Pars natural gas field development phase 9 & 10 project, which was completed in 2008. 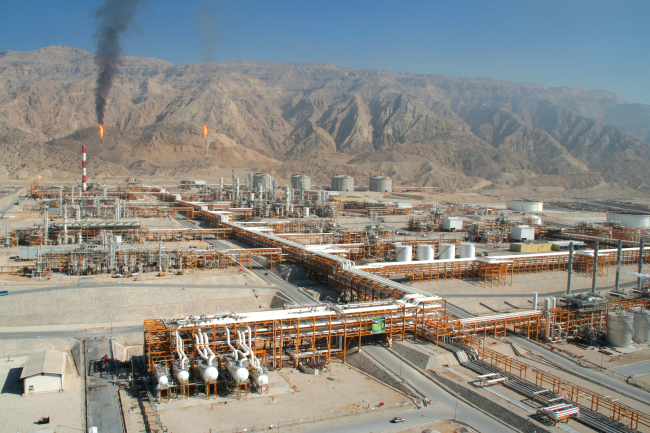 The South Pars gas field is the world’s largest natural gas field shared by Iran and Qatar. It is thought to hold at least 9.2 trillion cubic meters of natural gas. Iran has plans to develop the gas field in 24 phases. The Iranian government had ordered the swift completion of the phase 9 & 10 project at the time, as hundreds of people in the area had died during the winter of 2007 due to an energy shortage there, according to GS E&C. The firm reportedly received high regard upon the project’s completion in 2008, for having completed the facility’s construction before the winter as requested. The success of the South Pars project led GS E&C to win two mega deals in the following year, including an additional South Pars gas field development project as well as an LNG plant construction project worth $960 million. The deals, however, were canceled as the international community began pushing a set of harsher economic sanctions against Iran over its nuclear program in 2010, closing down the country’s major markets. As Iran reopened its doors to the outside world with the official lifting of sanctions last month, GS E&C said it was well prepared to regain its former leadership in the Iranian construction sector. GS E&C reportedly began preparing for its return to Iran starting from 2014, when early signs of the country’s economic reopening began to emerge. In 2014, the firm sent a sales representative to Iran to monitor new developments and strengthen its ties with local clients. The following year, GS E&C appointed a new CEO, who was familiar with the Middle Eastern plant construction business, to its Tehran office. It also strengthened its workforce there. Freed from economic constraints, Iran is geared to make big investments to tap into its vast petroleum reserves, signaling a range of new plant construction orders up for grabs, particularly those linked to the expected resumption of the South Pars project. It is also set to actively replace aging gas and oil extraction facilities as well as major industrial infrastructures, further creating new opportunities for overseas construction companies. With sanctions lifted, the Korea International Trade Association projects that Iran’s construction market will reach $154 billion in 2016, up sharply from the $88.7 billion in 2013.